- I think it is a very fair and accurate point to make that Michigan has been much more impressive today than Michigan State was last night. 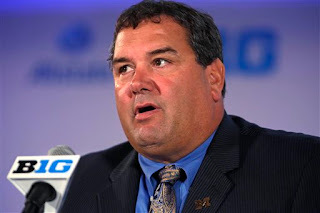 - If this game gets out of hand and turns into a rout for Michigan, it will still be quite interesting, depending on how Wolverines' coach Brady Hoke substitutes. Who doesn't want to see freshmen Derrick Green or Shane Morris play today? One is a 5-star running back, the other a 5-star QB. We've been reading about them for what seems like eons. Then again, will it be possible, with no other viable backup for Devin Gardner, for Morris to be redshirted this season. It would also be intriguing to see freshman running back De'Veon Smith carry the ball today. It was good to see what Drake Johnson, freshman running back who was a late add to Michigan's recruiting class in 2012 after breaking all kinds of records at Ann Arbor Pioneer High School, get the ball. He was redshirted last year. One thing for sure, the Wolverines don't appear to be short of talent at running back. - Central Michigan, despite the lopsided score, has done some good things today, but it is almost as if head coach Dan Enos is playing to keep this game close rather than winning it. The classic example of that was punting for a touchback while in four-down territory during the second quarter. It's tough, though, when the starting QB and RB (Cody Kater and Zurlon Tipton) are out. Tipton is CMU's best player. - Velocity isn't a problem for Gardner. He gunned that TD pass into Jeremy Gallon. He throws seam routes very well. He still seems to lack a little consistency, though. 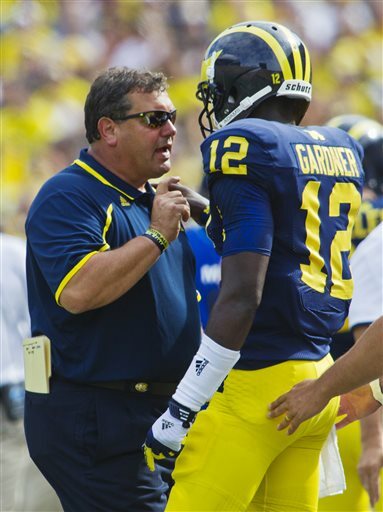 Michigan will have its share of teaching points when this game is complete. - Devin Gardner made two brilliant plays on the Wolverines' first offensive scoring drive which displayed why he might be a special QB. He didn't panic while scrambling in the backfield, keeping his eyes down the field and finding Drew Dileo for a huge game. Then, he followed his blockers brilliantly while picking his way through the Central Michigan defense on a remarkably easy touchdown run. - Dennis Norfleet is often forgotten when Michigan's is examined, but he does have game-breaking ability. We saw it on a reverse in the first quarter. He is elusive. - Joe Reynolds from Rochester Adams has done a terrific job of getting on the field at Michigan. Now he has made his impact felt by returning a blocked punt for a touchdown. Great story for a fifth-year senior wide receiver, who has earned it. - James Chapman, the Central Michigan cornerback, did a terrific job of jumping a short route and intercepting a pass. It was textbook stuff. But the Chippewas wasted a golden opportunity by not getting into the end zone and settling for a field goal. - Jeremy Gallon has become the master of the back shoulder reception. Gardner throws it well, too. - I know this: If MSU coach Mark Dantonio did put true freshman QB Damion Terry into the game, which the crowd at Spartan Stadium has been chanting for, there couldn't be any drop off from Connor Cook and Andrew Maxwell. They have been underwhelming, to say the least. But like last season, it's difficult to tell if their ineffectiveness is because they are playing poorly or just the overall dysfunction of MSU's offense. The two-minute drive at the end of the half was OK, but the Spartans benefitted from two pass WMU interference penalties. 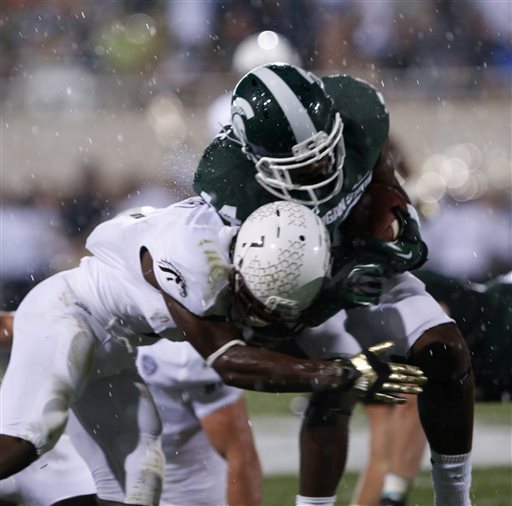 - MSU wide receiver Aaron Burbridge continues to disappoint. That was a terrible drop. Oh, and Bennie Fowler had a drop, too. Not good moments for the Oakland County duo of MSU wide receivers. - Yeah. 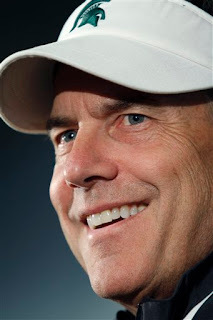 If I were the Spartans O coordinator and my offense was this bad, I'd resort to the "Wildcat" offense, too. Unfortunately for the Spartans, it appeared to be more like the "Mildcat" after one surprisingly good (by the standards of MSU's offense) play with tailback Jeremy Langford carrying the football. - This is remindful of the Spartans' first half performance last year against Eastern Michigan. The rub is Western Michigan is a better team than EMU last year. In that sense, the Broncos are a bit more ominous. But still, the Spartans should win this game going away. And last year, they trailed EMU. - You have to wonder much better Western Michigan would be doing in this game if it had Jamie Wilson, the Broncos' best receiver from last year. He is out with an ankle injury. Wilson was being viewed as a potential All-MAC player and has the genuine ability to stretch the field deep. The Broncos did connect on a one shot deep on the Spartans' defense, which has been heavy in the box near the line of scrimmage. Timmy Keith, who caught the long pass, was a three-star recruit in high school, so he has does have ability. He is coming back from injury. - Rain or not, Andrew Maxwell or Connor Cook at QB, MSU's offense continues to look completely out of sync. The new offensive coordinators have not made much difference. This looks like a replay of 2012 offensively so far tonight for the Spartans. - Western Michigan's offense has been just as ineffective. Added in with the rain, the first half was an ugly display of football. - The Spartans' offensive line has been disappointing. They should able to just run through the Broncos' defense, but haven't. - I am happy for the delay. There were several lightning bolts spotted above Spartan Stadium. There must be precautions, especially for those sitting in the second deck, which is quite high. What is bothersome is how many people are still sitting in the stands. MSU free safety Kurtis Drummond has played like an All-American in the first quarter of this game. That was a Charles Woodson-like interception. He's made three big plays. - The Spartans' defense has been extremely aggressive. They mostly have had nine defenders in the box, daring Western Michigan QB Tyler Van Tubbergen to throw deep, which is going to be difficult with MSU's pass rush and lack of separation from the Broncos' receivers. - The Spartans came out in a rhythm passing game, which was wise to give QB Andrew Maxwell confidence, but they are going to most deploy a power running game the rest of the way. It is simply the Spartans way under Mark Dantonio. - Riley Bullough is a hard runner with good body lean, who hits the hole quickly. After beating up on mostly floundering, non-contending teams, the Tigers have gotten a bit of a reality check from the potentially playoff-bound Oakland A's this week. Their vaunted starting pitching rotation has been hammered in the first three games of the series. Enter, for the series finale today, Max Scherzer, whose 19-1 record has been questioned because he has benefitted from getting more than seven runs per game in run support. It's also been questioned how meaningful Scherzer's astounding record is because the Tigers' rotation is so solid otherwise. In 2011, Justin Verlander consistently ended Tigers' losing streaks with stellar pitching performances. It was his biggest selling point in being named AL MVP. Of Scherzer's 19 wins this season, eight have followed losses. Four of his five wins in June, and his last three victroies in May, occurred when the Tigers had lost the previous game. 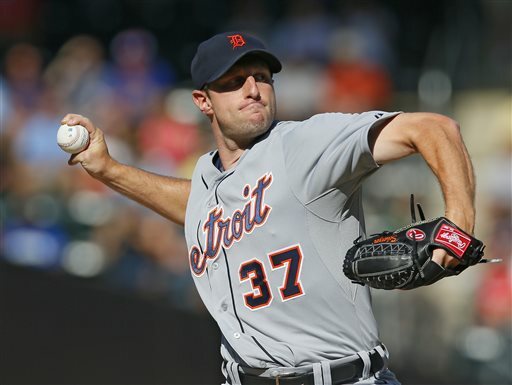 Scherzer's last seven wins, since June 28, came following a Tigers' victory. But it's been awhile since he has been tested in this manner. 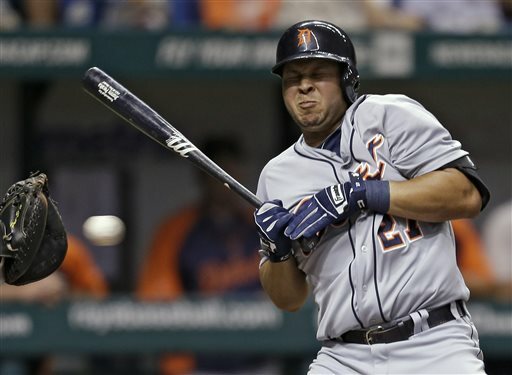 Phil Coke, Jhonny Peralta, Detroit Tigers - what to do in the postseason? The most underrated aspect about the Tigers is how much change there actually has been since they were swept in the World Series by the Giants. Quintin Berry, Avisail Garcia, Jhonny Peralta and Delmon Young all started World Series games. Phil Coke was the Tigers' closer. Phil Coke: Worth a playoff roster spot or should Tigers move on? Berry was cut in spring training and is no longer in the Tigers' organization, Young was allowed to leave as a free agent. Both, who played significant roles in 2012, Young especially in the postseason as ALCS MVP, have had dreadful years in 2013. Berry was released by the Tigers and has hit below .200 in the minor leagues (he was picked up the Royals and is at Triple-A). Young was released by the Phillies and recently signed by Tampa Bay. The Tigers traded Garcia to the White Sox as part of a three-way deal to get shortstop Jose Iglesias from Boston. He has followed the M.O. he established in Detroit by hitting for high average and little power for the White Sox, both in the minors and majors. Peralta, who surprisingly and inexplicably, played outstanding defensively in the '12 postseason for the Tigers, is suspended from MLB. He can still return to the Tigers. 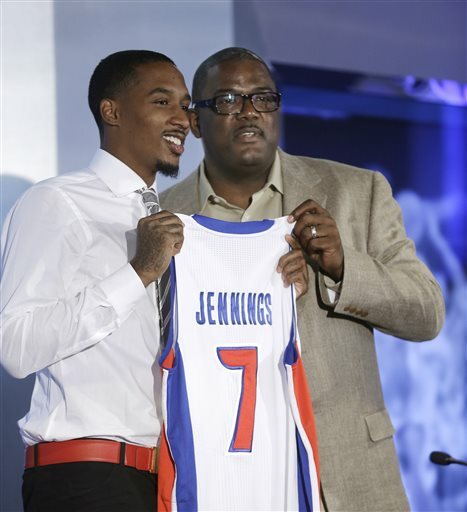 As can Coke, who was sent to Toledo to work out his issues after a disappointing season. My gut instinct about this is the change is good for the Tigers. They weren't, honestly, that stellar last season. They won only 88 games. If it weren't for a collapse by the White Sox, they might not have even reached the playoffs. They eked by the A's in the ALDS and the their sweep in the ALCS might have been as much because the Yankees were so bad rather than the Tigers being so good. The free agent signing of Torii Hunter has helped the Tigers immensely. The return of Victor Martinez has been a huge upgrade from Young. The Tigers made the right decision by picking Don Kelly, who has played well lately, over Berry for the extra outfield spot in spring training. I'm not so sure, with the Tigers' overall hitting firepower, whether they aren't better off with the slick-fielding Iglesias at SS instead of the range-challenged Peralta, who is the far superior hitter. Even if Joaquin Benoit falters at closer, Jose Veras has been acquired for insurance. The Tigers could use a situational left-handed and there is no other option than Coke, really. He hasn't give up a run in four appearances and four innings at Toledo. He has retired three of the four left-handed hitters he's faced. Is he better? Tigers general manager Dave Dombrowski is very calculated in these circumstances. He won't rule out Peralta's return, and certainly Coke is still very much in play for the postseason. But a roster spot in the postseason isn't something to waste. It's not an easy decision, but there is still time. Replay of our live chat Monday on Lions' as preseason winds down, the state of football with concussion issue, Michigan and Michigan State football and Max Scherzer's season in context for Tigers. We do this every Monday at 1 p.m.
- A lot of people might look at Willie Young's development into a decent player and think the Lions can't afford to lose him. I saw what he did tonight, after what he did last week vs. the Browns, and think maybe the Lions can't afford to keep him. That's the problem right there. There was no reason for him to touch Tom Brady or put his finger in his face or do anything other than foolishness. And that does translate into the regular season and key points of games. We've seen it over and over the last two years. - Otherwise, the Lions' defensive line needs to impose its will during the regular season like it has tonight. Ziggy Ansah continues to impress. - There is a downside to the Lions' lead. They have settled for three field goal tries. If they had scored touchdowns there, the first half would have been more impressive. Of course, it might have been different if Calvin Johnson were playing. But that has been one of the problems with the Lions. They have depended too much on Johnson. Reggie Bush is an obvious added weapon, but what about the wide receivers? There doesn't seem to be a lot there. Maybe somebody like Matt Willis can find his way onto the team. - I see most of this being on the Lions' receivers, but QB Matthew Stafford has seemed out of sync this preseason. - I'm sure they are complaining in Boston about how bad the Patriots look tonight, but there is a higher probability it will mean little when the regular season begins than it will with the Lions, who, despite their lead, look decidedly flawed in many areas. - Mistakes just kill the Lions don't they? Unreal. - Creating turnovers doesn't happen by accident. Those were big plays and a good sign. Nice hit by DeAndre Levy. He is an underrated player, in my opinion. - The short FG miss by David Akers was bad, and he's going to hear about it, and they will come in the form for cries for Kickalious, Havard Rugland. - Reggie Bush may finally have found the place were his ultimate potential comes through in the NFL. He is an immensely talented player if in the right fit. This appears to be it. - The unsportsmanlike penalty on Nick Fairley was incredibly bad. After last season? After last week? He has talent, but come on. There are some issues that may hold Fairley back. Ditto for C.J. Mosely, but the Lions really more from Fairley. - The Lions' receiving corps continues to be surprisingly underwhelming. They aren't winning the one-on-one battles in the secondary nor getting separation. 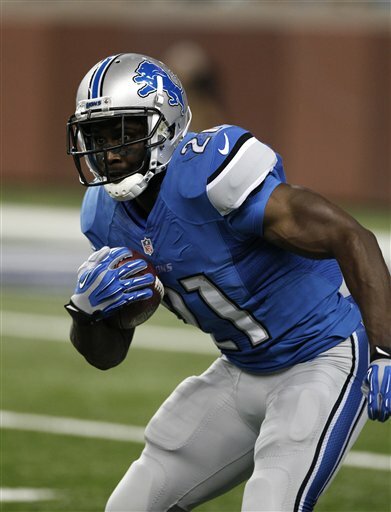 With Calvin Johnson out, it's like Reggie Bush is open or nobody is open. - Beautiful punt by Sam Martin. It was directional, inside the 10 and hung up high. No complaints there. But can he do it every week? He didn't last week and it was disappointing. - You didn't expect the Lions' to leave Darius Slay in single coverage and not have Tom Brady pick on him, did you? - There is a great crowd here tonight. It arrived a little late, but seats have filled up. Perspective about how the so-called "steroids" era has skewed baseball comes with this truly outstanding season that is being put together by the Tigers' Miguel Cabrera. It's a season whose magnitude will not be appreciated as much as it should because of what transpired in baseball during the late 1990s and early 2000s when the numbers were artificially enhanced. 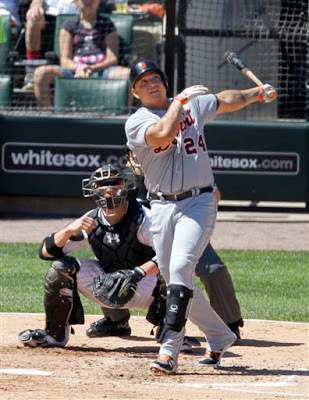 Cabrera is on pace to hit .360 with 52 home runs and 157 RBI. Remember when Cecil Fielder topped 50 homers in 1990 and it was the biggest story in baseball? It had not been done since 1978 by Cincinnati's George Foster. Well, it's happened 24 times since, although just once since 2007. Of the 43 times the 50-home run has been topped in a season, 23 occurred between 1995 and 2007. Henry Aaron, Ted Williams, Lou Gehrig, Harmon Killebrew, Stan Musial are just a few baseball's all-time great sluggers to not hit 50 home runs in a season. It's clearly an accomplished that has been devalued, which isn't fair to Cabrera if he does it for the first time this season. At 157 RBI, it would be the most by a major league player since 1949. Oh, except for Juan Gonzalez with 157 in 1998, Sammy Sosa with 158 in '98, Sosa with 160 in 2001 and Manny Ramirez with 165 in 1999. Batting average is a persistent stat. .360 is outstanding in any era. But it has more meaning now that average MLB batting averages have dropped into the .250 range. At the height of the performance enhancing drugs era, they were consistently above .270. OPS is where Cabrera's season is especially impressive - 1.141 is off the charts. But Barry Bonds, from 2001 to 2004, had a considerably higher OPS. Cabrera's OPS, if it stands the rest of the season, would be 49th all-time. - Nate Burleson is a fan favorite because he is a genuinely good guy, and has long been a good NFL playes, but tonight has not been a good one for him. He has had no separation and he dropped a first down pass. - David Akers, on grass, nailed a 48-yard field goal with no issue. The competition between him and Havard Rugland, aka "Kickalious" isn't even close, despite all the chatter about it. - The second half will be important for a lot of players because competition has been swung wide open by the poor play of the Lions' first and second units in the first two quarters. That is especially true at safety. - Penalties by Lions brutal. - Horrible first quarter by the Lions. - Sam Martin did not do well maintaining his consistency from last week. Poor punts the first few. And the Lions were fortunate a TD was called back because of penalty. Martin outkicked the coverage. - Reggie Bush is an obvious bright spot. He is a terrific talent. That much was obvious on a play in space again tonight. - Don Carey is not a starting NFL player. Saw that again on a Cleveland TD play. - Ziggy Ansah, Nick Fairley and Willie Young are playing well. The Lions have an imposing defensive line. - Chris Houston was beaten badly by Josh Gordon. If that's the Packers, that's a TD. - Where are the receivers? Doesn't seem like anybody is stepping up with Calvin Johnson out. 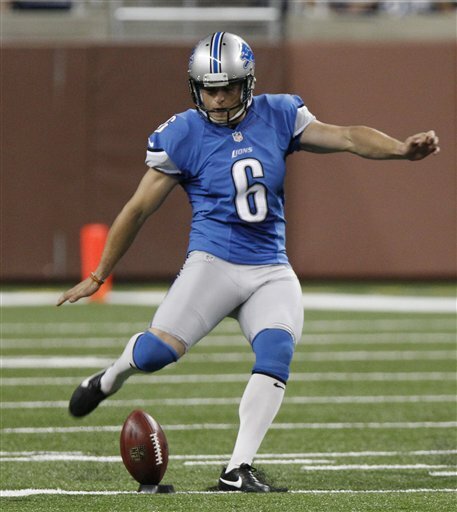 - Lions' fans are enamored with Havard Rugland, aka "Kickalious". Like you, I will be sitting on the edge of my seat tonight when he gets another chance, likely in the second half. It will be a stronger test, on grass and outside, in Cleveland. But I still see no circumstance where he is the Lions' kicker to start the season - even if David Akers gets hurt or falters. (I believe if push comes to shove the Lions would sign another kicker). Do you really want a YouTube sensation trying to win opening day with a 40-yard field goal with so much on the line? I do believe, if Rugland continues to make progress, it's possible he will placed on the practice squad. - The far bigger issue as it actually pertains to the Lions in 2013 is punter Sam Martin. He was extremely impressive vs. the Jets in the preseason opener, both punting and with kickoffs. But consistency is the key. - The Lions' Ziggy Ansah was taken with the fifth overall pick of the NFL Draft, and Barkevious Mingo was selected sixth overall by the Browns. Both are edge, pass-rush athletes. Each was impressive in their preseason NFL preseason debuts last week. They will be on the same field tonight. Who will perform better? - This is the second look at the Lions' revamped offensive line. The starters will be on the field longer. How will they fare? I didn't get a real good gauge on it in the first preseason game. - This is a big game for cornerback Bill Bentley. I touted him long before the Lions' drafted him in the third round in 2012. I thought he played well in the practices I've seen in Allen Park. He did not play well vs. the Jets, however. - Patrick Edwards showed a flash of impressive speed on a punt return that was called back because of a penalty vs. the Jets. Can he do it again tonight? Also, what can Theo Riddick, the sixth-round draft pick from Notre Dame, can do as a returner? Hope we see tonight. - The Lions need better play from their backup safeties and linebackers. Depth at those positions remains a concern and is imperative not only defense, but because of the trickle down effect it has on special teams. 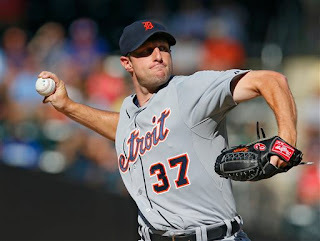 Kansas City Royals, Detroit Tigers - examining the "threat"
While it appears the Tigers devastated the Indians with a four-game sweep in Cleveland last weekend, the Kansas City Royals have emerged as a threat. Of course, "threat" is a relative term. The Royals, their 1-0 loss at Miami Tuesday night aside, have been winning a lot of games. The Royals were 8-20 in May and apparently done. They are 39-21 since June 4 and decided against being sellers at the trade deadline. But it nonetheless underscores the frustration the rest of the American League Central has vs. the Tigers. Tigers, Royals: Is it going to be a pennant race? They have gained exactly one game in the standings. The Tigers lead the Royals by 6.5 games heading into Wednesday. They were up on KC by 7.5 games before the Royals turned around their season. Five-game series (this one caused by an earlier weather postponement) are rare, but the Royals come to Detroit this weekend for a 5-game set that will be perceived as huge in KC. I'm surprised by the Royals' turnaround. Statistically, it doesn't make sense. They are offensively challenged. The Tigers have scored 129 more runs than the Royals, who are 11th in the AL. The Royals team OPS is .694, well below the AL average.(.725). James Shields and Ervin Santana have stabilized the Royals starting pitching, and closer Greg Holland is having a brilliant season, but it's not like the Royals pitching is daunting, despite leading the AL with a 3.52 ERA. On paper, these two teams aren't even close (the Tiger's team ERA is second in the AL at 3.55). The Royals have traditionally given the Tigers trouble head-to-head, though, and this season has been no exception. The Tigers have a 13-3 record against Cleveland, but are 3-5 against the Royals, who won two of three games at Comerica Park as recently as late July. All the Tigers must do against the Royals this weekend is win two of the five games. If they do that, the damage in the standings will be minimal - regardless what happens Wednesday. The schedule, which is running down, will be shortened. Only if the Royals win four games in the series will the momentum shift in the division race be significant. As is, 11 of the Tigers final 43 games (26 percent) will be against the Royals. Nearly half those games will be gone after this weekend. - Riley Reiff did a very poor job of pass blocking on Jets' linebacker Quinton Coples, The result was an inexcusable sack. If he doesn't step that up, the Lions are in serious trouble. - Matt Willis is an older receiver with just one NFL TD, but he sure didn't hurt his cause for making the team with two excellent catches on the Lions second quarter scoring drive. He had been with Denver for several years. - It was called back because of a penalty, but Patrick Edwards did show surprising explosiveness on a punt return. It was some thing sorely missing last season. He was a very productive college player at Houston the Lions have been bringing along. I'd be surprised if they don't find a way to put him on the opening day roster. - Willie Young is having a good game. The defensive line has been impressive overall. - Local story. Lions running back Joique Bell catching a pass, making a tackler miss in the open field and being brought down by Nick Bellore, who was a terrific linebacker at Central Michigan. I don't think it is a fluke Ziggy Ansah made a big play in his first preseason game with the Lions. He is athletic. He is tall. Their defensive line is imposing even by NFL standards. He is part of it. Ansah did the same type of things during the Senior Bowl workouts and during the game. Ansah is not just a terrific athlete, he has excellent instincts for the game. Too much has been made of his inexperience. - Sam Martin's first punt was extremely impressive. It was a 54-yard directional kick for a fair catch inside the 10-yard line. Also, he routinely slammed his first two kickoffs to the back of the end for touchback. Good signs. - Bill Bentley missed what should have been an easy open field tackle on the Jets' tight end early in the first quarter. He could have prevented a first down and didn't. It was a disappointing play. Conversely, on the same play you could see why the Lions wanted to re-sign DeAndre Levy. He can run and closed quickly and made the tackle. - You got a glimpse at what Reggie Bush can do when he gets the ball in space. - Although it's just a preseason game, it's almost like stealing candy from a baby for Calvin Johnson. It'd been far more interesting if the Lions' tested Dee Milliner with Johnson rather than Patrick Edwards. It was nonetheless an excellent play by Millner to prevent a TD. - Backup safety is an obvious concern and you can see why already early in the preseason. Chris Hope is past his well past his prime and Don Carey is, well, Don Carey. It was alarming on the Jets' scoring drive. - I am convinced the radar gun in Cleveland is not accurate. It has clearly been reading several miles per hour higher than the one at Comerica Park, and in other major league ball parks. 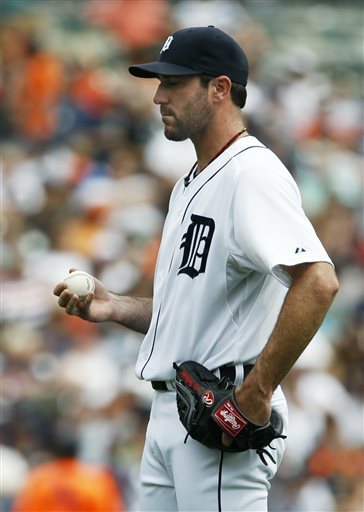 Not that Justin Verlander didn't pitch well Tuesday. He did, but it was his command of the baseball, not his velocity that was the difference. He has been throwing that hard much of the season, and has had similar solid outings, which were not praised nearly as much because the radar gun readings did not have him throwing 100 mph again like the one in Cleveland did. Also, I don't believe Bruce Rondon threw the ball consistently harder than any pitcher in Major League history, which the radar gun readings in Cleveland suggested Wednesday. Rondon throws extraordinarily hard, but not that hard. Come on. I was curious one day when Jim Leyland mentioned in passing about how the radar gun readings at Comerica Park are "slow" and they "were going to do something about it." Now I understand why. Perception of the club's pitchers, perhaps even among the pitcher's themselves, is often based on these readings, which are far from consistent park-to-park. It's kind of silly when you think about it, but just the way it is. - Prince Fielder is going to hit. His career is on a Hall of Fame track. He is 29. It's just not going to go away mysteriously without injury. He is having his worst season since early in this career, but could be good news from the standpoint there will be statistical correction, which could come late in the year or postseason. Also, Fielder was the Tigers' only reasonably consistent left-handed hitter the first half of the season and he hits behind Miguel Cabrera, who has, not coincidentally, has became an even better hitter the last two seasons with Fielder hitting behind him. 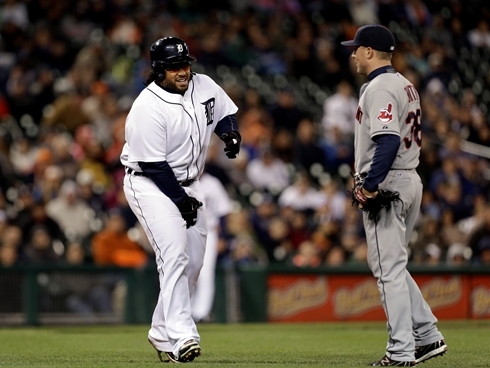 As such, Fielder's contribution to the Tigers offensively this season has still been significant. His dramatic game-winning hit Wednesday wasn't exactly a fluke or an aberration. He is a premier hitter. - Jeremy Bonderman as a reliever may work. He struggled to find a third pitch as a starter, but he can get by with his slider, which is still an outstanding pitch based on his outing Wednesday, and fastball as a reliever. 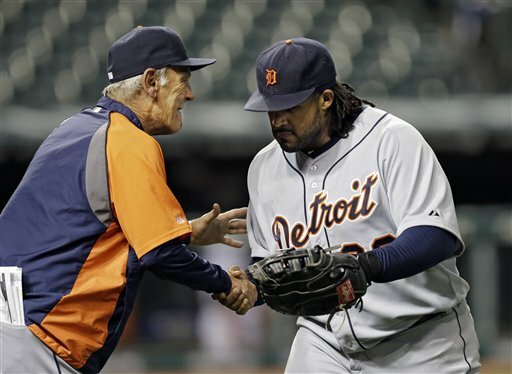 - This will not go on forever for Don Kelly, but Leyland is wise to ride him while he is hot. 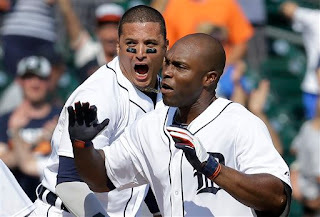 - Austin Jackson is, oddly, the most underrated player on the Tigers. He has hit two very clutch home runs during the Tigers' 11-game winning streak. - The Tigers are clearly in the collective minds of the Indians. They have just destroyed them. But it's not just the mind game the Tigers are winning. If you compare the two teams player-by-player throughout the lineup, bench and pitching staff, it isn't even close. Brandon Jennings: Great talent or great player? 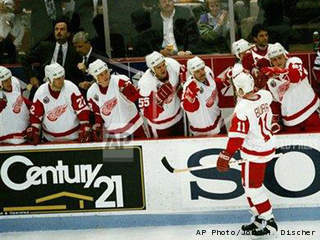 The Red Wings have been an incredibly successful franchise for more than two decades. But their turnaround in the late 1980s and early 1990s didn’t happen by accident nor overnight. The Steve Yzerman draft pick in 1983 was the most significant move. There were others, though. One was Shawn Burr being taken in the first round with the seventh overall selection the next year, 1984. Burr, who died Monday, joined the Red Wings about the same time I started at The Oakland Press. I was the high school writer, but I took extra time to cover the Red Wings. I went to their training camp my first year. It was at McMorran Arena in Port Huron. I recall interviewing Burr, as a rookie after his first training camp practice, while he was riding on an exercise bike. He was a kid, but you could tell he was going to make it both in regard to talent and demeanor. And Burr did make it. He played 16 years in the NHL. He was a terrific two-way player. He was also a wonderful person, who was nice to everybody. A few years back I was the PA announcer at Red Wings alumni game. The game raised a lot of money for charity. Burr was the star of the show in regard to autographs and engaging with fans. If time could take back things, hopefully one would be putting Burr on one of the Red Wings’ Stanley Cup championship teams. He was worthy, and unquestionably part of their current legacy.